The world of baseball scouting seems to have its own language, and while some of the terms are fairly obvious, some of them are less obvious. So this page will attempt to define some of the less obvious terms. Projection – When scouts talk about projection, they are doing just what it sounds like; projecting what they believe a player will turn into. This can be used in both the skill as well as the physical application. A pitcher who is, say, 6’5 and very skinny at age 17 has the chance to add 20-30 pounds of muscle and basically fill out a perfect frame for a power pitcher. Conversely, a short and squat player lacks projection, because he is physically mature already. Projection is difficult, because different people mature physically at different rates, and some tall kids never actually do fill out. From a skill perspective, if a player is very athletic, but his baseball skills are raw, you can project his skills to improve with repetition and instruction. Raw – This is a word you will often hear associated with a player just drafted/signed, or a very young prospect. It essentially means that the player is athletic, or “toolsy” (a word I’m trying to not use anymore) and that his athletic ability far surpasses his actual baseball skills at the moment. The 20-80 Scale – This is the gold standard for prospect evaluation. Scouts grade prospects on their basic tools. For position players, there are 5 tools. Arm strength, quality of fastball (movement and velocity), secondary pitches, mechanics/composure/pitchability/long term health. The latter category is tough to give a number grade to. 70 = well above average: This is MLB all star level. Not quite the best of the best, but pretty consistently close. 60 = above average (+): You’d consider this a strength of the player, but he’s not the best or one of the very best. 50 = average: Just what it says. Major League average. 3 Slash Line – The common reference to a player’s batting average/on base percentage/slugging percentage batting line. Contact Rate – A hitter’s ability to make contact with the ball….obviously. Normally measured as an inverse of K%. To go deeper, strikeouts as a percentage total plate appearances minus (BB + HBP). A graphical representation of the defensive spectrum can be found here. The arrows indicate the most common movement between positions. Plate Discipline – The ability to swing at pitches in the strikezone and ignore pitches out of the zone. Measured most commonly by BB%, that is, the percentage of plate appearances which end in a walk. Raw Power v Present Power – Inexperienced or raw hitters could possess excellent power in batting practice, but not be able to translate that power to live pitching. A player with big raw power, but very few extra base hits could have other factors limiting him from translating his power to game situations. Trigger – Also called a timing mechanism, its the little piece of movement a hitter does right before he starts his swing. Common triggers include a toe tap or cocking the hands. Excessive movement pre-swing can lead to timing issues, but removing them all together could cause a player to lose his rhythm and get out of sync. Overhand: Just what it sounds like. 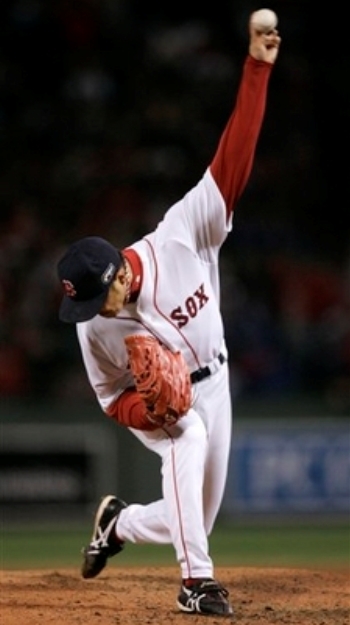 The pitcher’s arm swings almost straight over the top. An example would be Hideki Okajima. Sidearm: Just what it sounds like. 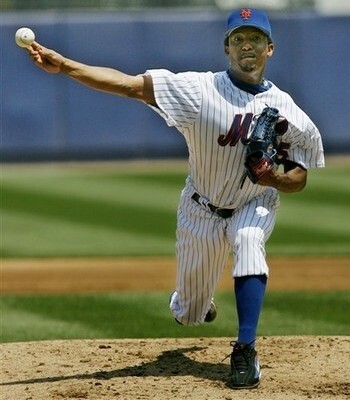 The pitcher’s arm comes from a near 90 degree angle. An example would be Pedro Martinez. Three quarters (3/4): The most common arm slot, this is a half way point between side arm and over the top. 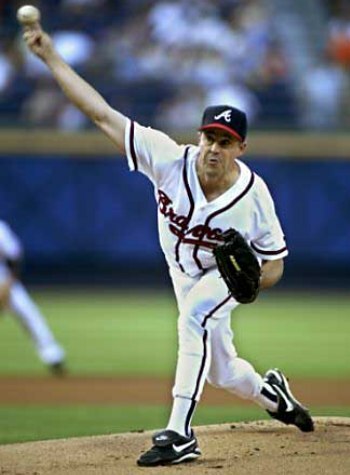 Greg Maddux is a good example. Submarine: The most entertaining to watch. These guys drop their arm and practically scrape the ground. Chad Bradford is a great example. Of course, these 4 slots are the basic guide, there are lots of variations. You will often hear “high three-quarters”, which simply means between 3/4 and over the top. Low three-quarters would obviously be between sidearm and three-quarters. Pitchers with lower arm slots are generally able to achieve much more horizontal movement on their fastball. Lower arm slots also make it more difficult to throw a curveball, because of the need to snap the wrist, and the difficulty of doing it from that angle, making the slider more common from a lower slot. A changeup can be thrown from any arm slot, as it is held very similarly to a fastball. Average v Peak Velocity – When scouts say a pitcher “sits” at a velocity, it means the majority of his fastballs will fall into this range. When a scout says a player “touches” a velocity number, it means the pitcher was able to log one or two pitches at a higher velocity when he reached back for extra power. A common representation of this in a scouting report will read like this: Player X sits 90-92 and can touch 94. This means the bulk of his fastballs were in the 90-92 range, but one a few occasions he was able to hit 94 mph. Pretty intuitive, but it doesn’t hurt to spell it out. Command – Command is the ability to throw the ball to specific quadrants of the strikezone (or out of the zone) with precision. Control – Not to be confused with command, control is the ability to throw the ball in the strikezone. It is possible that a pitcher can throw the ball in the strikezone, but cannot control the ball to specific quadrants. Thus, it is possible to have good control, but below average command, and is ultimately what separates the different levels of pitchers in terms of skill and upside. LOOGY and ROOGY – Lefty One Out GuY and Righty One Out GuY are terms used for pitchers who show large platoon splits for varying reasons. Pitchers who throw side arm or from very low arm slots generally have pronounced platoon splits, and thus are much more effective against same side hitters and generally never face opposite side hitters. Examples of LOOGYs are Mike Myers and George Sherill. ROOGYs are less common, but submariner Chad Bradford is the best example. Pitchability – A fancy word for intelligence. Pitchability is the ability to set up hitters and exploit their weaknesses while focusing on your strengths. It is occasionally used as a negative connotation for pitchers who do not have exceptional stuff but who get batters out by “pitching backwards” or just throwing tons of strikes. Pitching Backwards – The approach of throwing offspeed pitches early in the count, and then finishing off a hitter with a fastball. The common strategy is to throw fastballs early to get ahead, then throwing offspeed pitches to fool hitters and make them chase. Pop time – The time it takes for a catcher to throw the ball to 2B, measured from the time the ball hits the catcher’s glove until the ball hits the middle infielder’s glove. An average time is 2 seconds.